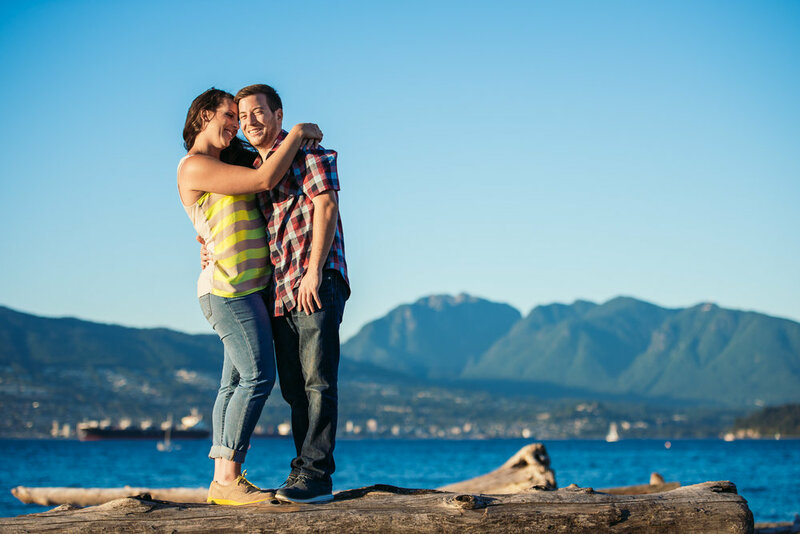 We met with Hayley and Kyle at Jericho Beach to do their sunny and fun engagement photos, because it’s one of Hayley’s absolute favourite places in Vancouver. Being from the Toronto area, where their wedding will take place, Hayley and Kyle wanted their engagement photos to reflect their new life in Vancouver. We started off the shoot by meeting their pooch, Hunter, swinging on swings, and jumping on logs! At sunset, we headed over to the waterside for a gorgeous view of downtown Vancouver, where Hayley and Kyle donned their Vancouver Canucks hats with glee – a playful nod to their Toronto-loving kin!